This blog is just a life story — censored, edited and with most of the good stuff left out. Last night I went down to Two Roses Inc, a tattoo parlor, barbershop, and cafe in Barrio Logan for a full service haircut and it was amazing. The place has a good feel to it, everyone was friendly, at least three or four tattoo artists introduced themselves to me and chatted while I was waiting including the owners. By the time I got in the chair Carlos the barber was chatting and we were having a good time, looking back on it, I’m not sure why I turned down his offer of a glass of Scotch while I was getting trimmed, but there will always be a next time. 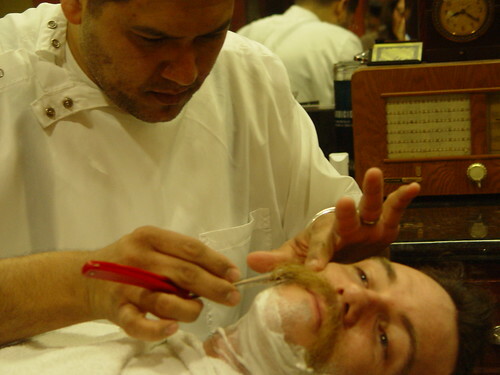 After the cut he started prepping me for a shave with a straight razor. I was really looking forward to this because I hate shaving, so someone else doing it for me seemed pretty nice, and because of the old-time-machismo-getting-shaved-with-a-big-ole-sharp-blade thing. He started by putting some moisturizer on my face. Then wrapping me in a hot towel. He did this about three times to soften my skin and get it ready to shave. He put on some warm shaving cream and started shaving. By this time he’d been chatting it up and built some rapport so I wasn’t nervous about the blade at all. he shaved all around, taking extra care around my beloved moustache. When done he toweled me off, put some sort of after-shave on that burned, but as he said “it doesn’t quite hurt, just makes you feel alive”. He put some more moisturizer on there and then toweled all the hair of my face, back and everywhere else it ended up. I was feeling great, in a sort of relaxation-haze, about to stand up when I pulled out a massager and gave me a little back and neck massage. It was already the best haircut of my life, but that just put it over the top. He even recomended some waxy like stuff for styling my moustache, I’m gonna give that a try tonight to see if it holds up better than the Clubman’s wax I’ve been using. Not only was this the best, most relaxing haircut ever. It was cheap too. The haircut was just a bit more than Supercuts would charge, the shave was $16 as well. The best part about it was the comfortable, old time feel they’ve got going.